One thing we take very seriously here at The Urban List is wine. No really, we don’t care if it’s red, white or a crisp and delicious rosé, we love it all equally. Welllll, almost. One that rises above in this very biased writer’s eyes is rosé and, in particular, French rosé. 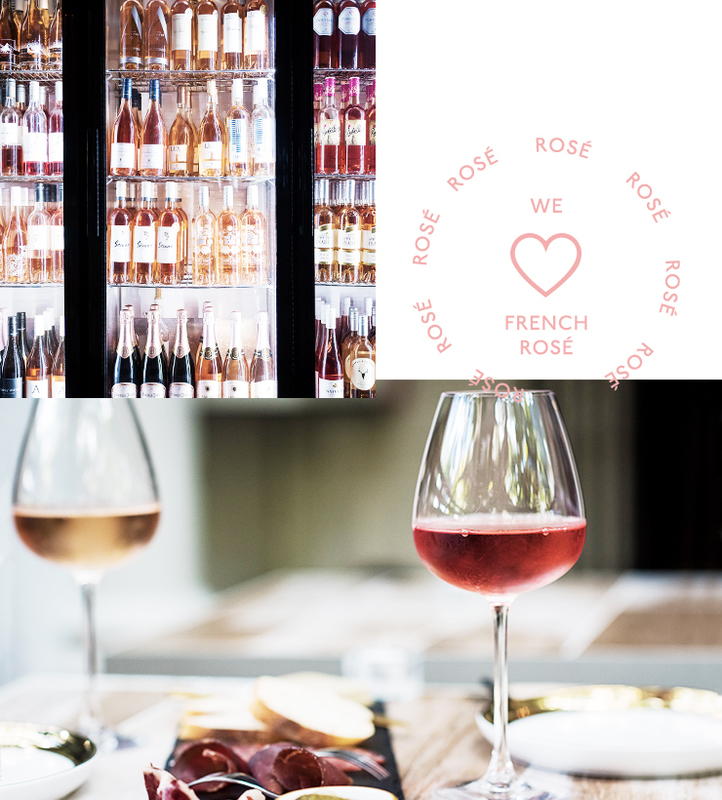 It was brought to my attention, while (very thoroughly and tirelessly) researching this article, that I’m a bit of a rosé snob; someone who heads to the bar and asks for “a glass of rosé, the lightest one you have and preferably French”. So, you can imagine my shock and horror when I was introduced to delicious tipples from Spain, Turkey and even Australia. We know, it surprised us too team. 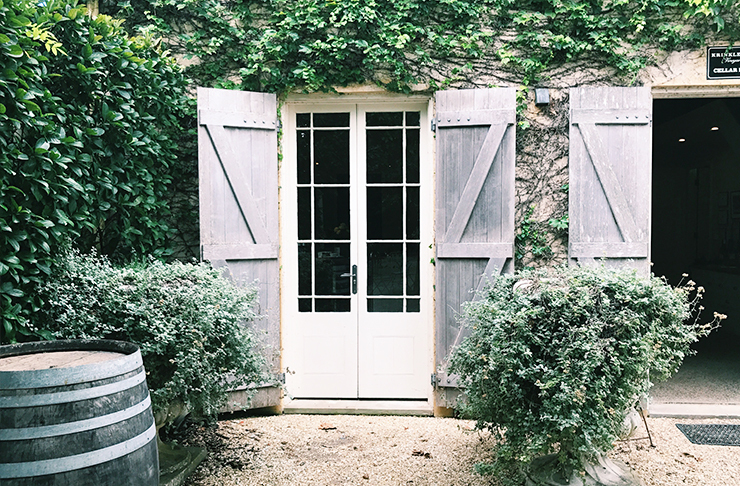 This article will teach you why French rosé is a special little drop, how to solve the wine list riddle and walk away from the bar with a glass of wine you actually want to drink, and a big fat hot tip about one of our top Australian winery picks. Go on, pour a glass and take a read, you know you want to. When it comes to rosé, the French are the undisputed world champs and we dare you to even try to fight that point. Hint: you’ll lose. And to debunk the majesty that is French rosé, we’ve enlisted Melbourne wine guy and sommelier slash bar manager at Archie Green because he really knows his wine. Big time. So, what is French rosé? Contrary to popular belief, rosé is not a blend of red and white wine, and to be completely honest, I’m thinking this idea came from the old preschool days of learning about primary colours and going mental, mixing them all together. Anyway, I digress. Rosé (in France, anyway) is made using only “free run” juice which is juice that’s extracted by the weight of the grapes on the top of the pile crushing those on the bottom. Voila! Say hello to the trademark salmon or onion skin-like colour. Now, the crème de la crème of rosé is from Provence and the region actually accounts for about 60% of the total rosé wine produced. With influences from Italy and Spain, plus peak Mediterranean climate, rosé from Provence is basically fool proof. One thing to note, though, is rosé doesn’t age very well and after about three to four years, it’ll start to lose its zippy acidic edges (i.e the reason we all love it). And because our new friend Stu just gets us, his top tip sings straight to our heart. Never buy the most foreign rosé (it’ll probably be from central France, made from the stuff they were about to throw out). Spend the extra few dollars, if you have to, and go for whatever they have from Provence, lightly chilled, with whatever fresh seafood you can lay your hands on. Well, we’re sold. If you’re not a wino and just know that you like what you like and basically, just hate everything else, wine lists can be a very daunting thing. That’s why I decided to head on down to the world’s first rosé bar, AKA Sydney’s Rosé Royale, and interrogate the bar’s co-owner, Jerome. After taking a seat and being presented with bottle upon bottle of the good stuff, sipping away at, well, all of them and finding myself in that fuzzy place that only comes from sipping wine just before dinnertime, he let me in on all the secrets. 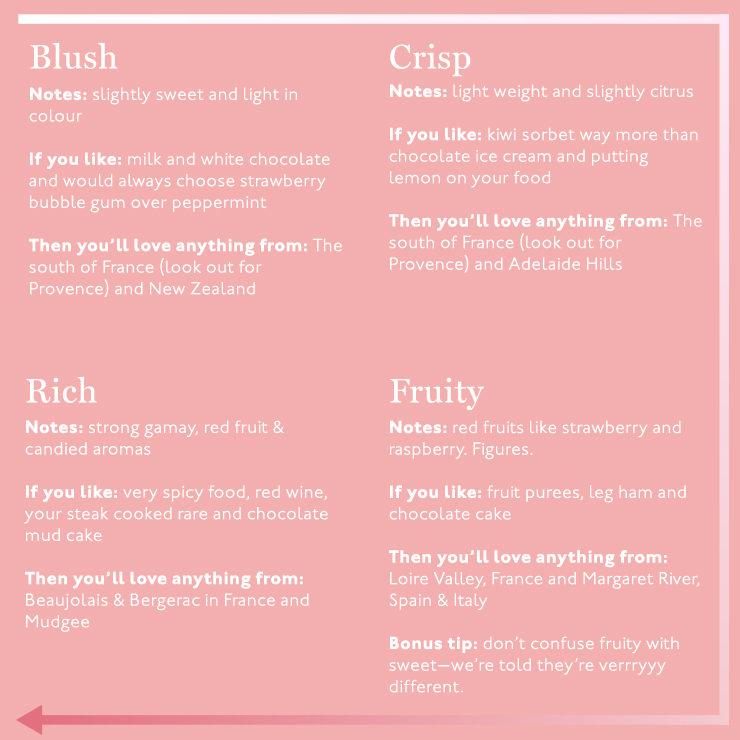 All rosé—French or otherwise—sits in one of four categories and because we love you, we can tell you exactly which one you fall into based on a few of your favourite foods. Disclaimer: our mate Jerome also told us that some wines can fit into multiple categories, so if you’re an inbetweener (AKA can’t decide between a fruity or a rich rosé) then order something from Bordeaux. Short answer, we’re told yes. Longer answer, still yes. If you love the sweetness of a blush (we’re not talking about moscato-level sweet, don’t you worry), the acidity of a crisp rosé, the roundness of a fruity tipple and the bold punch of a rich, then you’ll want to know about this one. We’d like to introduce you to a rosé that comes straight from Turkey. Yes, Turkey. Imported by Sydney locals, Efendy and Anason, the Sevilen Majestik Kirmizi Syrah is a blend of predominantly kalecik karasi grapes with a touch of Grenache thrown in too. We can personally vouch for this one being the perfect gateway rosé and all-around crowd pleaser. Finally, we come to our third rosé lover and expert—founder of Krinklewood Vineyard in the NSW Hunter Valley—Rod Windrim. Rod runs the vineyard with his children and together, they believe the rising popularity of rosé in Australia is due to its versatility. You can enjoy it with any food and on any occasion, and we tend to agree. They bottle their Francesca Rosé (named after Rod’s first-born grandchild, no less) in a flint (clear) bottle to show off the pale colour because that’s what’s probably going to draw you in, to begin with. Like music to our ears, when we asked Krinklewood how their wine differs from a crisp French rosé, they told us that it doesn’t. Inspired by the O.G. (guys, you know this one) Provence, their wine is produced in the same way, with the same grapes and in a very similar climate. Bloody. Win. Ready to tackle fortified wine next? Read this.